The Pacific War Online Encyclopedia: Lee, Willis A., Jr.
Table of Contents Next: Leese, Oliver W.H. "Ching" Lee was the premier battleship admiral of the U.S. Navy in the Pacific War. 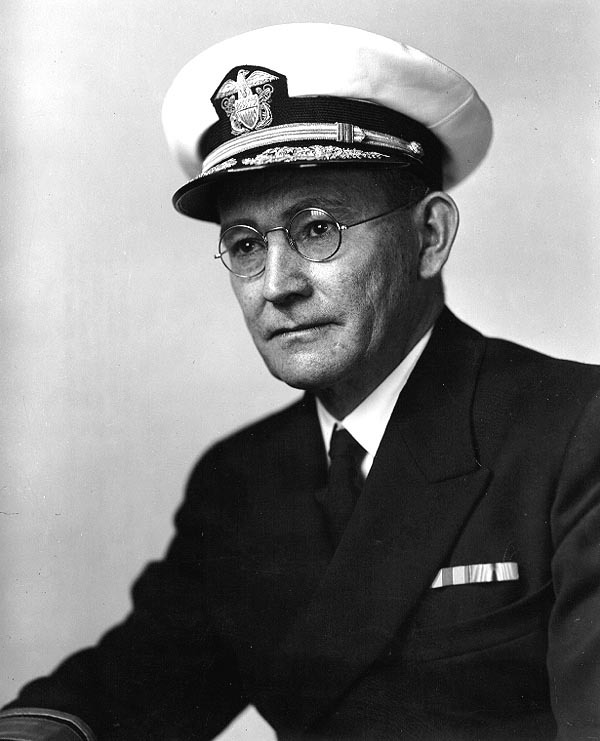 Born in Kentucky and a 1908 graduate of the Naval Academy, he participated in the Vera Cruz operation and commanded destroyers in World War I. Between the wars he graduated from the Naval War College (1929) and held a wide variety of command and staff assignments, including serving as senior member of the Anti-Aircraft Defense Board that recommended adoption of the Oerlikon and Bofors guns. 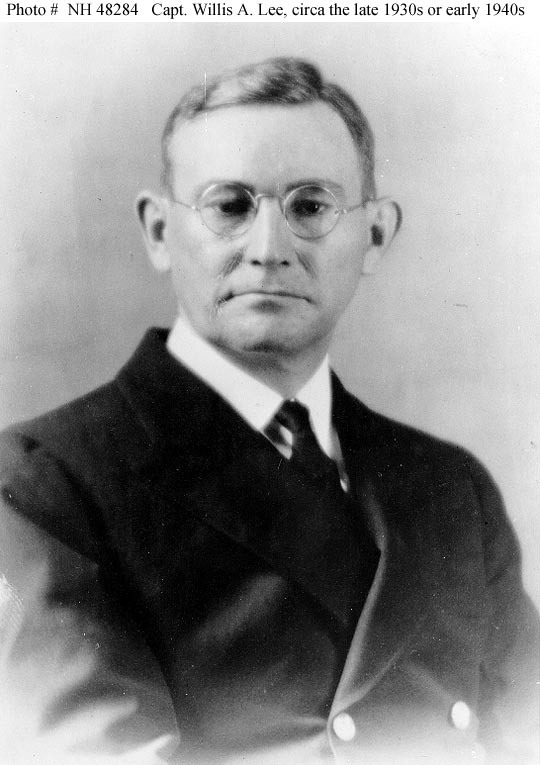 The outbreak of war found Lee serving as director of fleet training. In August 1942 he took command of the fast battleships in the South Pacific (Battleship Division 6), a post he held until nearly the end of the war. 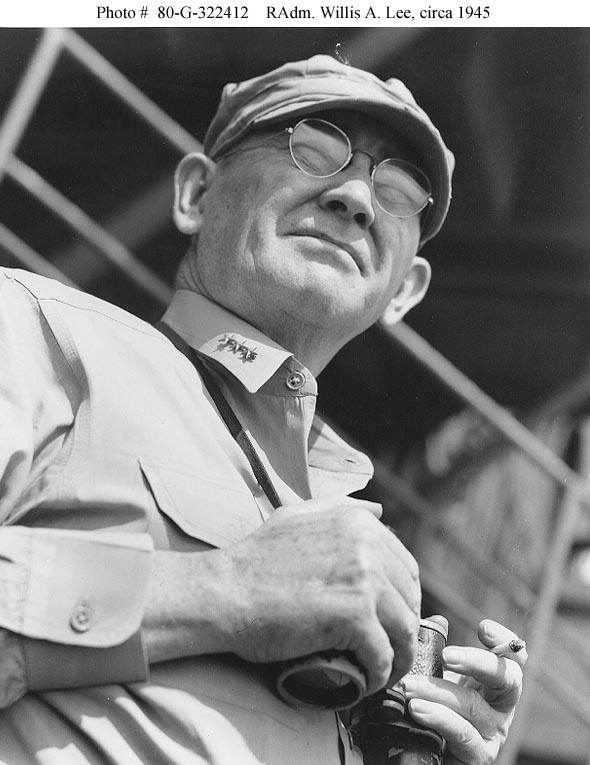 He was an expert in radar-directed gunnery and developed the Navy's doctrine for cooperation between fast battleships and carriers. 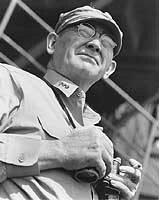 He was present at the Naval Battle of Guadalcanal (at which he was the victorious commander in the second round), the Battle of the Philippines Sea, and Leyte Gulf and saw service off Okinawa. He died of a heart attack while commanding Task Force 69, a research organization in the Atlantic formed to find ways to deal with kamikaze attack. This is Ching Chong China Lee. Refer your big boss about Ching Lee. Call off your boys! MITSCHER TO LEE: Do you seek night engagement? It may be we can make air contact late this afternoon and attack tonight. Otherwise we should retire eastward tonight. LEE TO MITSCHER: Do not, repeat, not believe we should seek night engagement. Possible advantages of radar more than offset by difficulties in communications and lack of training in fleet tactics at night. 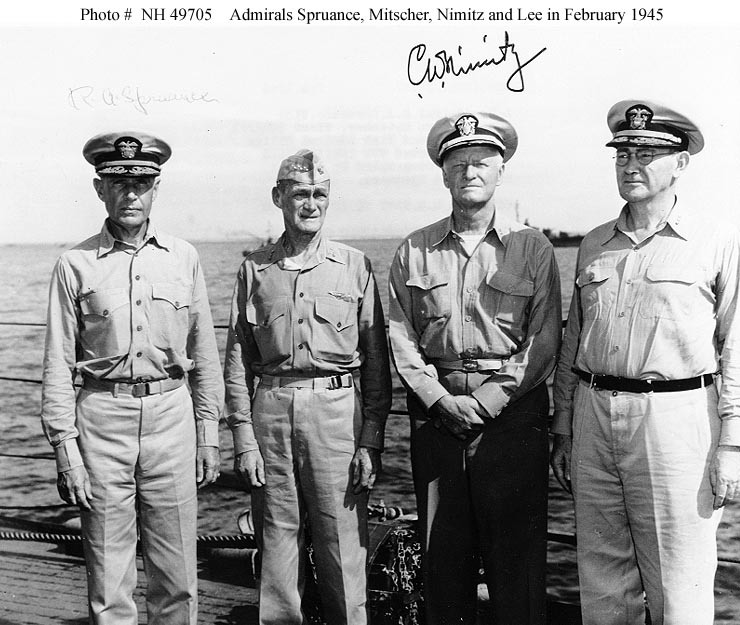 We told Admiral Lee to tell Halsey to leave something out there watching the strait, because they were bound to come out and everyone seemed to know that. But the reaction was, if you tell Halsey to do something, that's the one thing he won't do.... In my opinion it was the greatest tactical blunder of the war.